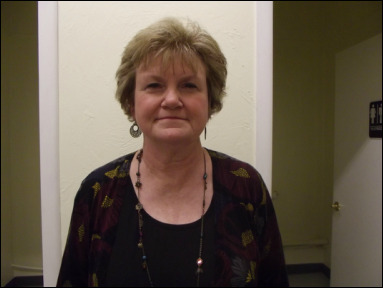 Lyla Phelps is the Friends of the Tuttle Public Library (FOTPL) vice president. In the past, she has served two years as secretary and two years as president. She joined the FOTPL seven years ago when the group was still working to get a library proposal on the ballot and join the Pioneer Library System. Though the group was able to get this on the ballot, it did not pass. They also were able to get a proposal for a city library on the ballot, but that also failed. After struggling several years to get a library that would be operated by the city, the group decided to open a library financed by fundraisers and donations. As a board officer, Lyla helps direct plans for the library and assists with special events. She often donates resources for the libraries fundraisers and operations. Lyla and her husband, Doug, have lived the last 27 years of their 33 year marriage in Tuttle. Doug grew up in Pocasset. They have raised their two children here, and own a home renovation/rental business in Tuttle. They both also have jobs as programmers in the computer industry and met when both were working at Phillips Petroleum in Bartlesville. After retiring, Lyla is looking forward to having more time to do the things she most enjoys. That will mean getting to watch more basketball games. They share Thunder season tickets with another couple and go to about half of the home games each season. Lyla also loves cheering on the Jayhawks basketball team from her home state. The Phelps went to Italy three years ago, and are looking forward to more travel. Lyla enjoys sewing, and when their children were young, she made all their Halloween costumes. She has helped the library by providing supplies and expertise in making several quilts to raffle over the years. Lyla also loves to read. Her favorite books are suspense thrillers by John Grisham or David Baldacci. After working 40 years, Lyla is anticipating that retirement. She loves that we have a library filled with books she can read, but also that she can use OverDrive to check out books online using her Tuttle Library membership. Having the wonderful resource of a library for our community with books, internet, OverDrive, and children’s programs makes Lyla’s heart glad. Lyla shared, “Our goals must always be changing to grow with our community. A goal that I still have is that we can become CERTIFIED.” If the Tuttle Library was a certified library, it would be eligible for grants that currently it is not, interlibrary loan, and many other services that an all-volunteer, all-donation library does not qualify to receive. To be certified, the library must have at least partial local government funding (perhaps assisting with a librarian’s salary), paid employee(s), and be open more hours per week. Lyla strives to offer the community the very best library. Her vision is a larger space with many more programs offered for all ages, and open more hours so more people can benefit. If you have not visited the library, come check it out!